These are lyrics by Silverchair that we think are kind of repetitive. Silverchair's, "Do You Feel The Same"
Could I be read if I was see-through? How many times must you ask this, Daniel? The answer is, who knows? this pisses me off so much...i mean, we got it the first time, daniel!!! But it's all the same to me! The line is repeated 8 times...ugh! 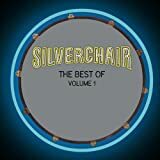 Silverchair's, "World Upon Your Shoulder"